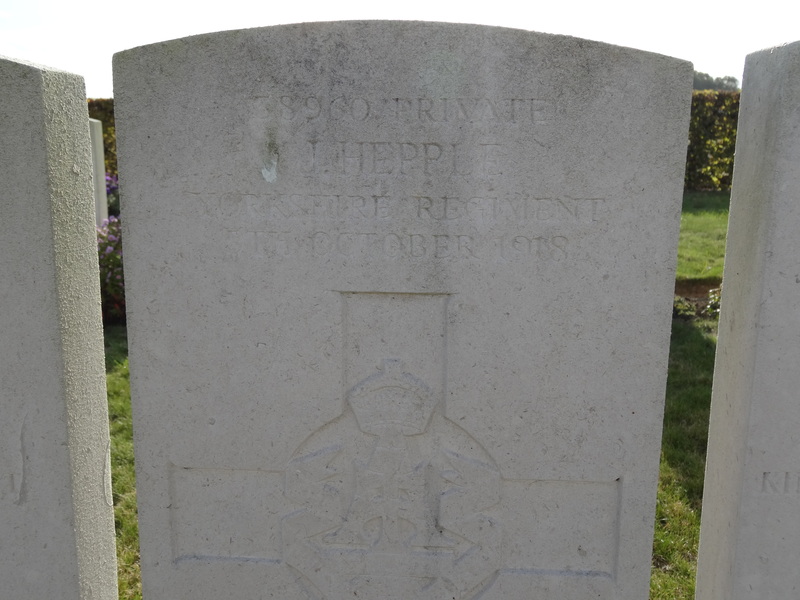 38960 Private John Hepple, 9th Battalion, Alexandra Princes of Wales’s Own (Yorkshire) Regiment died of wounds 5 October 1918 and is buried at Tincourt New British Cemetery, France. He was 35 years old and is commemorated on the Woodland War Memorial  and the memorial plaque in St. John the Evangelist Church, Lynesack. 69th Trench Mortar Battery formed June 1916. 26 August 1915, the Division landed in France at Boulogne and fought on the Western Front until November 1917 when it moved to Italy. In September 1918, the battalion returned from Italy to France and was attached to 74th Brigade 25th Division and took part in battles during the 100 days to victory. The reformed Division moved back to France in September 1918, moving first to St. Riquier near Abbeville. Later in the month it entrained to join the Fourth Army, coming under XIII Corps which was by now engaged more or less continuously advancing across Picardy. 3 October: the 74th Brigade was concentrated at Moislains. 13.00: 9/GH left Moislains for the line south of Le Catelet. Late in the afternoon, orders were received to continue on October 4th the attack started by the Australians on the 3rd to complete the capture of Beaurevoir and the high ground beyond it. 4 October: by day break the 25th Division had taken up a line from Canal des Torrens to south-west of Guisancourt Farm, about 3000 yards. The 7th Brigade opened the attack against very strong and well defended German positions with machine guns concealed in buildings and along the railway. The attack was only partially successful and casualties were heavy. 74th Brigade moved up in the evening and took over half the front. 75th Brigade moved up to Quennemont Farm. 6 October: Guisancourt Farm was taken in the morning and was made secure against any counter attacks. 9 Green Howards moved forward and dug-in in front of it. Later research records that the 9th Battalion, the Green Howards, lost 3 officers and 52 other ranks killed in action or died of wounds between 3 and 6 October 1918. 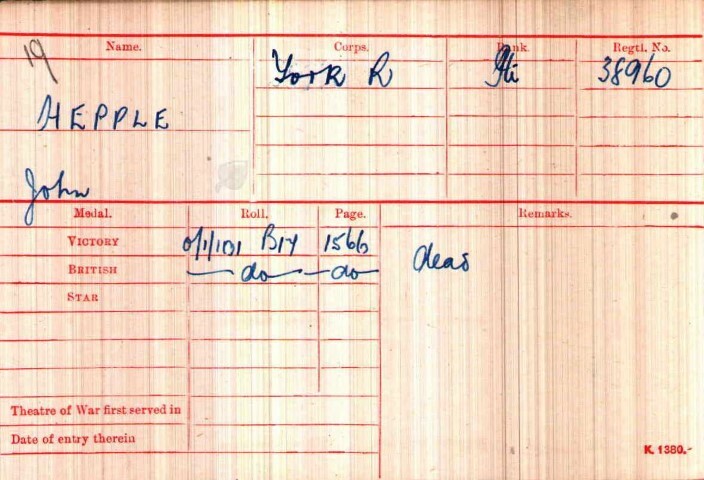 Private J. Hepple was awarded the British War and Victory medals. 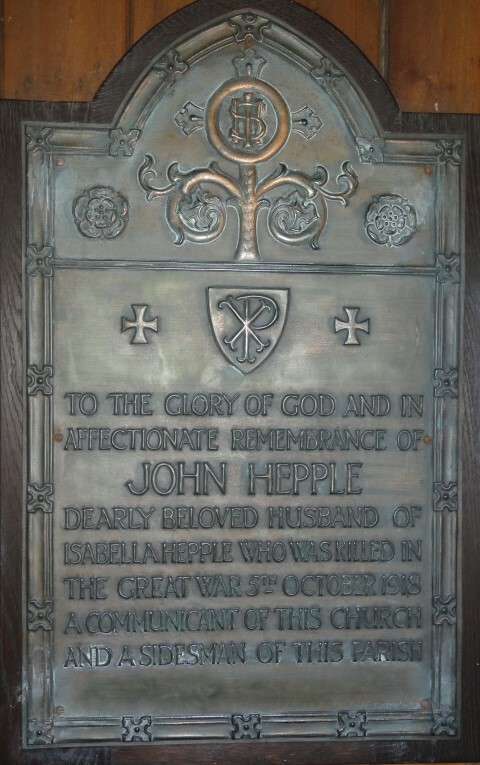 Private John Hepple is commemorated on the Woodland War Memorial,  the memorial plaque in St. John the Evangelist Church, Lynesack and a specific Memorial Plaque to him in the Mission Church, Woodland.